Cooking a chicken every week and just throwing all the extra away would be easy. EASY, I tell you. But, it’s slightly harder to keep coming up with new ideas for leftover chicken (what, it’s week two and you’re complaining already?). To be honest, one of the main things I hope to take away from this little project is the ability to whip up delicious meals from leftover chicken in any circumstances. Climbing a mountain, checking out new clothes at West Quay, reading a book – no matter what I’m doing, in under a year’s time, if someone hands me a chicken carcass, I’ll be able to make faster than light movements, as if casting some magical spell, then produce a delightful meal that no one will even be able to tell is leftovers. This did not happen this time. In fact, this isn’t even chicken. Forgive me, and let us move on. This isn’t so bad now, is it? It’s my take on a tapas platter. I’ve never eaten tapas in a restaurant before (shame, shame), but if someone brought me this I’d eat it. Okay, so it’s not Spanish, but this would be a lot easier if you shut up objecting and just listened to what’s on it. Oh, you’re not shouting at me? Well, you’re very well behaved. Jamie’s Super Tasty Spanish Chicken left me with a heck of a lot of spuds to dispose of. Reheated potatoes, especially when eaten the following day, can have a tendency to taste weird and gluey, but luckily I really like cold new potatoes. So, how Spanish is that? 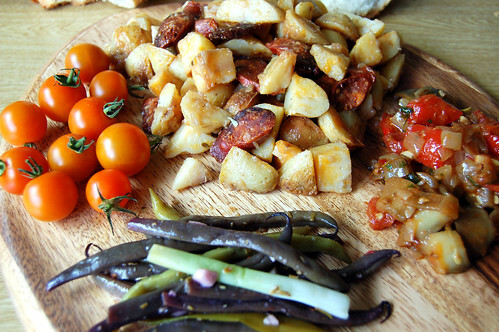 New potato and chorizo… err… salad. And then we have Magic Beans from Allegra McEvedy’s Leon cook book. I made them yesterday from the beautiful beans I bought at the Hampshire farmer’s market, and it was a lovely new addition to my limited ‘how to cook green (and purple) beans’ repertoire. I now know two recipes. You make these beans by frying 2 tbsp olive oil with 2 chopped cloves garlic, 1/2 chopped red chilli with seeds still in, 1 tbsp chopped rosemary (gross story) for a couple of minutes, or until the aromas are released. Then you add your topped (but not tailed) beans – 200g or so, and stir to coat them in the liquid. Then add 2tbsp lemon juice, 2 tbsp water, and cover with a lid and cook until soft – about 15 minutes. Then add 3 spring onions, cut into 8cm batons, season, and cook with the lid on until wilted. Then, rest for five minutes. 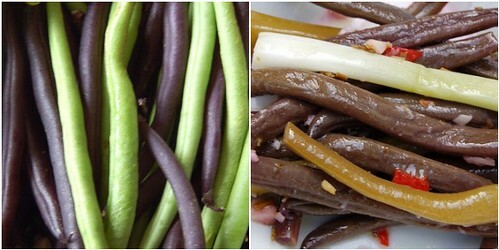 As you can see, purple beans go kind of black when they’re cooked… I sort of like it, although at the time I didn’t much appreciate the look. Maybe this is a good Halloween dish…? 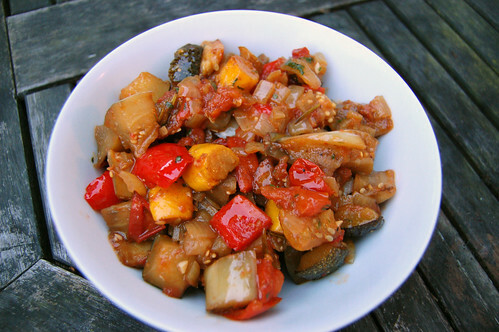 The final cooked dish here was ratatouille (yay, I spelled it right without checking! But then I checked to see if I spelled it right, so I’m not sure if that counts…). I used the recipe from Angela Nilsen’s Ultimate Recipe Book– I love this book so much. It’s not so much the recipes, but the stories she writes before them. She takes a classic recipe, like hollandaise sauce or roast chicken (yes, we shall be doing this during the project!) and then tries to make it into the ultimate recipe by experimenting and talking to top chefs to get advice. Her spaghetti carbonara recipe is now the only one I’ll use. So I used up my white aubergine and a yellow courgette (that’s eggplant and zucchini to you American folk) for this. I was the only one who ate it, but a portion is saved in the freezer for J, M’s veggie sister. I hope she likes it. I did! 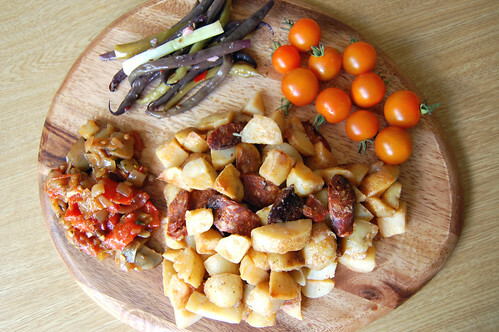 That was the final cooked recipe – the last item on my not-so Spanish tapas board is a batch of golden cherry tomatoes, also from the market. They are delicious. I ate them with my fancy-schmancy French sea salt, and very good it was too.